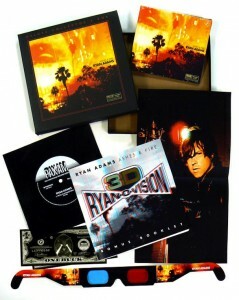 I know there are several people out there like me who count down the days for new Ryan Adams music. Thankfully, the wait is over as Adams’ latest LP, “Ashes & Fire” is now on the streets. “Ashes & Fire” is Adams’ first record of new material after a lengthy (according to Adams) two year hiatus, and one that is much more mellow that some of his previous solo efforts. That doesn’t go without saying that the material is second class or fluff, but perhaps the softer approach is Adams easing back into things after taking some time away from music. As much as I’d love to see a new Ryan Adams record be released every month, I’m appreciative of what is released, be it his crazy 1980s heavy metal craze or the sweet, buttery sounds of his country croon a la The Flying Burrito Brothers. Occasionally, some interesting talents lends a hand on an Adams record, and “Ashes” is no different. Mandy Moore and Stephen Stills’ son, Chris Stills offer up some high harmony here and there, as does old friend Norah Jones. Even The Heartbreaker’s piano maestro Benmont Tench tickles some electric ivories throughout the record. All the players on “Ashes” delicately weave the usual Adams’ ‘love and melancholia’ to a science, or better still, as a well-deserved after-hours cocktail of tea and sympathy. As prolific as Adams typically is, I wouldn’t be surprised to see additional music be released from the “Ashes” sessions. Fans who were eager to get their hands on the new record via the deluxe pre-order were treated to some additional songs not featured on the regular release, like “Darkness” (which coincidentally will see release as a limited edition 7″ for Record Store Day’s “Black Friday” event) as well as a flexi disc of “Petal In A Rainstorm” (remember flexi discs?) Other goodies included a full digital download of “Ashes”, including a special edition 3-D booklet, glasses, mini 3-D poster of Adams and “Pax-Am Bucks” to redeem for future Pax-Am online purchases. The limited edition pre-order bundle is actually pretty sweet, all housed in a special 45 RPM record-sized box. I feel for anyone who didn’t spring for the extra goodies. The flexi disc is almost worth it alone. There are very few artists these days that keep me poised at all times for their work. Thankfully, because of Adams creativity and his musical craftsmanship, he’ll continue to keep me interested. “Ashes” is a welcomed ‘comeback album’ for his catalog, even though he never really went away long enough to make a comeback album. Regardless, “Ashes” gives you just enough to want even more the next time around. Pick up the deluxe edition of “Ashes & Fire” here. New Music From Jimi Hendrix Coming March 5th! This entry was posted on Monday, October 24th, 2011 at 9:06 pm	and is filed under Music. You can follow any responses to this entry through the RSS 2.0 feed. You can skip to the end and leave a response. Pinging is currently not allowed. « Gordon-Levitt Joins Tarantino’s ‘Django Unchained’!!! Issue a standing kill order on Jason Bourne, effective immediately.